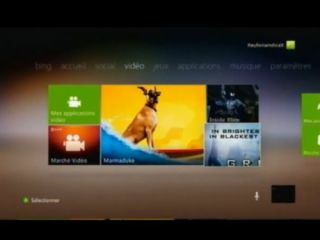 A leaked video shows Microsoft's forthcoming update to its Xbox 360 dashboard, due to go live on 15 November. The new update incorporates Microsoft's "Metro" design language, as we've previously seen in Windows Phone 7 devices and the developers' preview of Windows 8. Rather than the current panel-based dashboard, the new update integrates sparse Windows Phone 7-style tiles showing all your content. There's also support for Bing search, which seems to suggest Microsoft is placing more emphasis on web browsing from within the console. Bing will search content on the console too, so your copy of Battlefield 3 will be displayed alongside the latest news about the fraggin'. Better Kinect integration is promised with the update, but the video fails to show someone flailing their arms about in search of their games. The dashboard update's touted voice control is notable in its absence from the video, although the video is completely mute and shows a French build. It's a big update to Xbox's interface, and one that puts it more in line with Microsoft's other products. Expect to see it land on your console on 15 November - also the tenth anniversary of Xbox's original Live service.